Delta Air Lines is in the news again and it is not good. The U.S. based airline’s treatment of a passenger in a wheelchair has come under heavy scrutiny. Maria Saliagas, the passenger, has multiple sclerosis and was flying to Amsterdam from Atlanta earlier in April with her husband, said Nathan Saliagas their son. The couple was to connect in Amsterdam and fly on to Athens, Greece. When they landed in Amsterdam, the couple waited for wheelchair and then when reaching the gate of their connection, she was changed to a new chair. Nathan said his mother, because of her condition, was falling over and in pain, so someone with the airline used a blanket to tie her to the wheelchair. Nathan said a similar and even more severe incident was experienced by the family a few years ago and their fares were refunded by Delta. This time, Nathan said that Delta offered the couple 20,000 travel miles, but said they would not be issuing any refund. Saliagas called that highly unethical and said it seemed as though the issue has been justified by the airline. Passengers are able to request the airline’s wheelchair service that is operated by a sub-contractor. 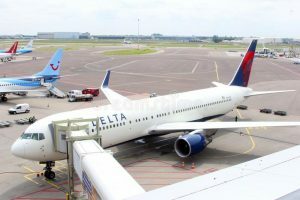 In Europe, a law passed by the European Union requires that airlines use the wheelchair services that the airport contracts, according to Delta’s website. The Amsterdam airport has hundreds of people they have hired to be Passenger Assistants that provide customer-friendly, professional assistance to those passengers that have reduced mobility and disability, said its website. The website also said that travel agencies and airlines pass requests on to them for passenger assistance. The wheelchair vendor that is airport contracted was waiting to assist Saliagas at the gate said a Delta spokesperson. After leaving the plane and being moved from one wheelchair to another Saliagas become uncomfortable and felt as though she were slipping. The Delta spokesperson said the blankets were then used in order to secure her comfortably in the chair. Delta, through a prepared written statement said they were disappointed that their customer had not felt like they were well-cared-for and would ensure that their return flight would exceed all expectations. The statement added that while Delta is always looking for new ways to make improvements to the customer experiences, its findings do not line up with details that the customer’s family shared. Norfolk Southern Corp. Shares Bought by Boenning & Scattergood Inc.